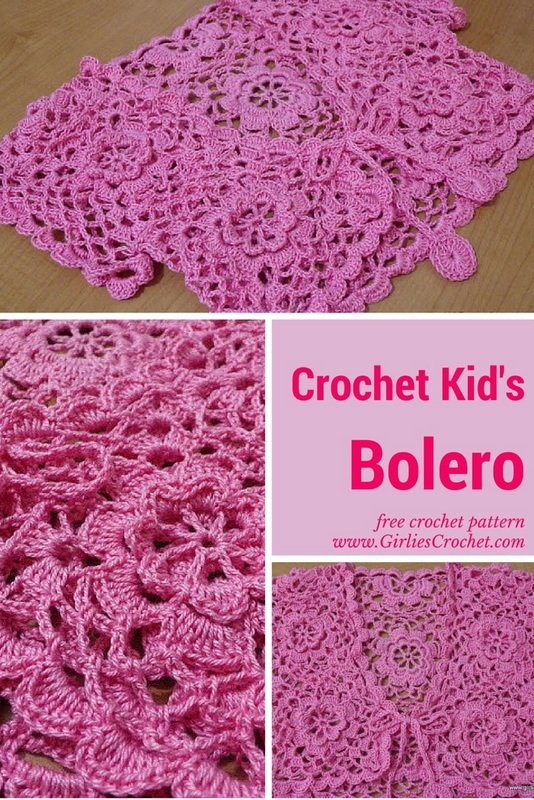 An easy and free crochet pattern for crochet kid's bolero, a pink bolero for 4 years old. 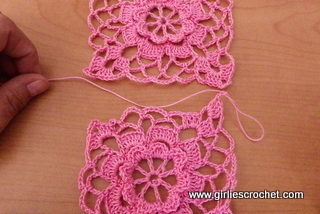 This pattern is fit to 4T-6T. 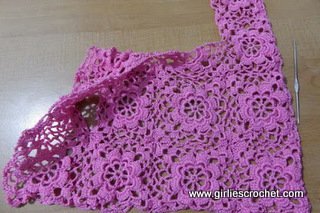 The instructions for this Crochet Kid's Bolero is broken into 3 pages. 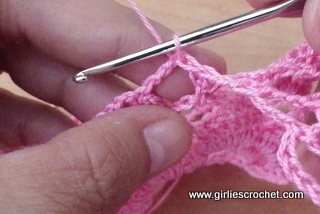 If I put the instructions on this page only... it will take you too long and become boring to look at. 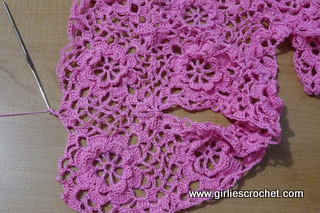 Thank goodness for the photos, your eyes will have a little break and maybe have fun looking at those photos. 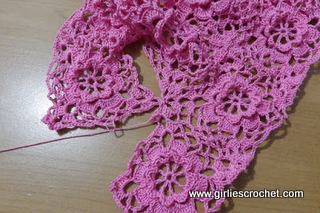 Still, it is better to break it into 3 pages, so please bear with me. 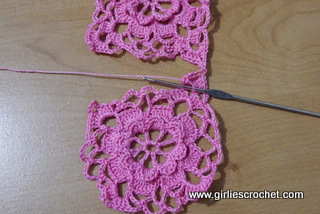 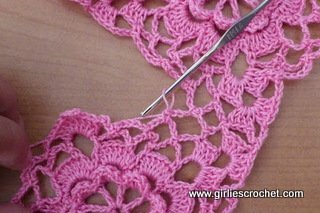 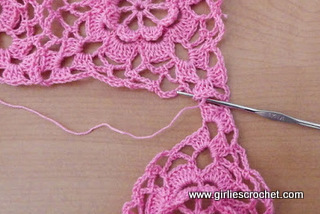 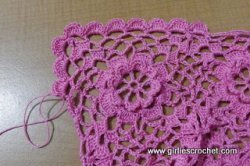 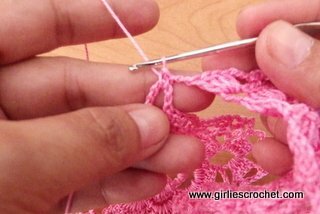 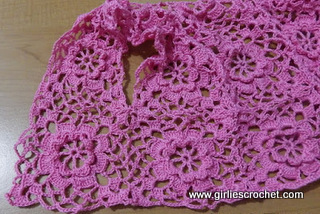 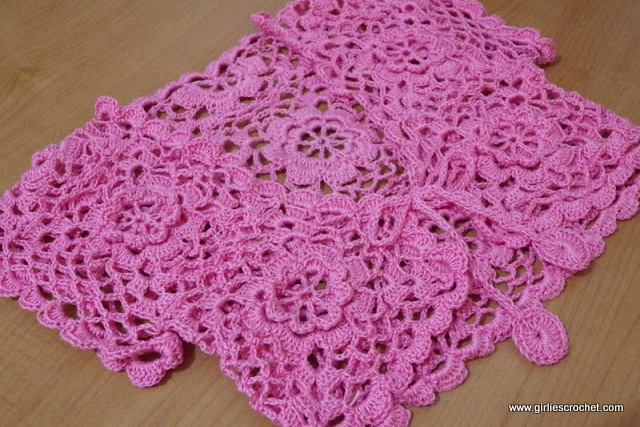 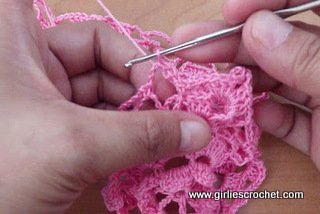 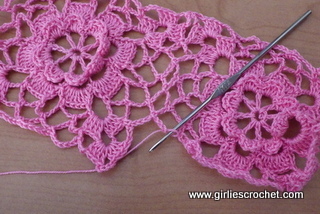 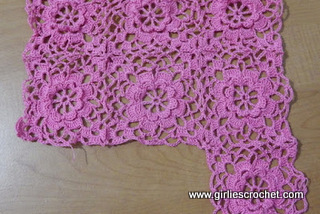 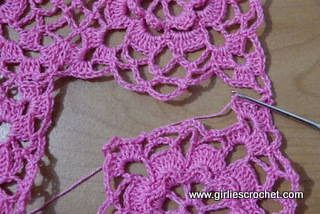 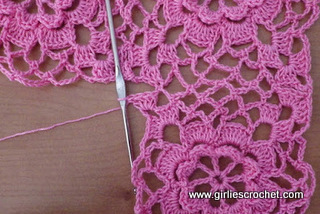 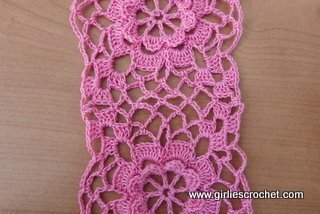 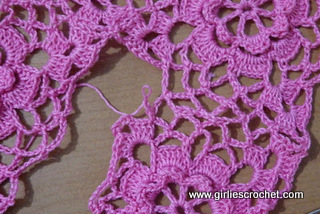 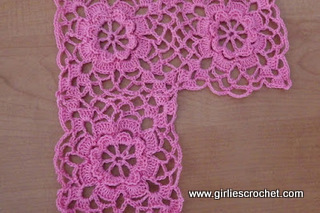 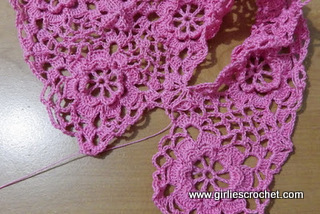 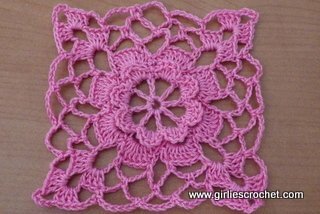 Below photo shows how to join the flower square motif into crochet kid's bolero. 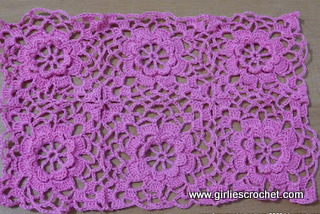 Motif A2: Repeat Round 1-6 of flower square motif. 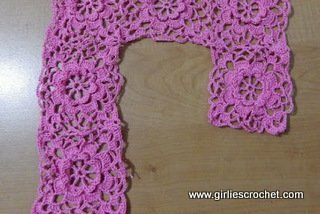 skip 3ch sp of 2nd motif, sc in 1st dc of 2nd motif, ch2, sl st in 1st dc of 1st motif, skip 3dc of 2nd motif, 4dc in next 5ch sp, ch2, sc in 5ch sp (2nd corner) of 1st motif, ch2, 4dc in the same sp of 2nd motif, skip 3dc of 1st motif, sl st in next dc of 1st motif, ch2, skip 3dc of 2nd motif, sc in next dc, ch6, skip 3ch sp, sc in next 6ch sp, ch6, sl st in 1s sc of motif 2. 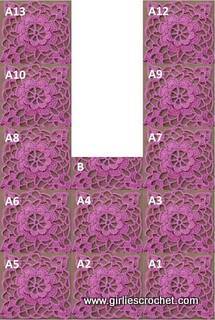 Motif A4: Repeat Round 1-6 of flower square motif. 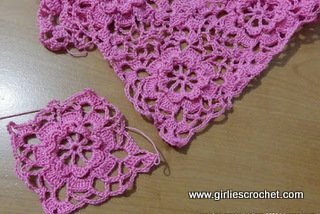 3rd motif, ch2, skip 3dc of 4th motif, sc in next dc, ch2, sl st in next 6ch sp of 3rd motif (consider sl st as ch1), ch3, sc in next 6ch sp of 4th motif, ch2, sl st in 6ch sp of 3rd motif, ch3, sc in next 6ch sp of 4th motif, ch2, sl st in next 6ch sp of 3rd motif, ch3, skip 3ch sp of 4th motif, sc in 1st dc of 4th motif, ch2, sl st in 1st dc of 3rd motif, skip 3dc of 4th motif, 4dc in next 5ch sp, ch2, sc in 5ch sp of 3rd motif, ch2, 4dc in the same sp of 4th motif, ch3, skip 3dc, sc in next dc, ch6, skip 3ch sp, sc in next 6ch sp, ch6, sl st in 1s sc of motif 4. 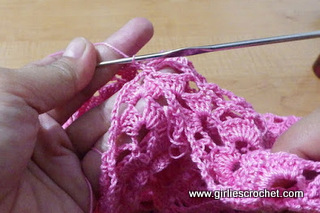 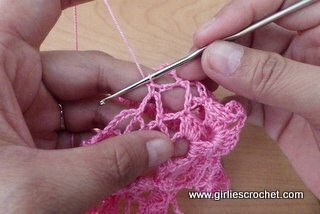 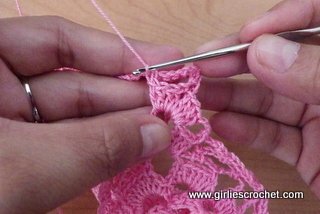 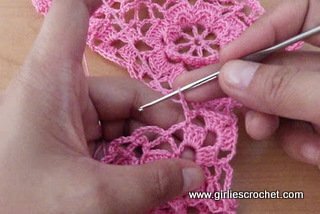 This time, you need to crochet the Motif B before proceeding to Motif 12 & 13. 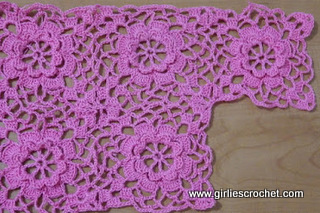 Please click here for Motif B instructions. 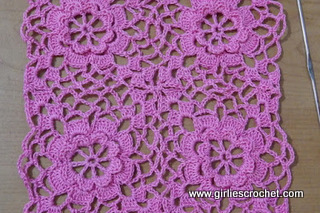 Motif A12: Repeat Round 1-6 of flower square motif. 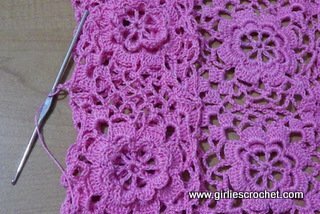 ch2, sl st in next 6ch sp of 1st motif, ch3, sc in next 6ch sp of 12th motif, ch2, sl st in 6ch sp of 1st motif, ch3, sc in next 6ch sp of 12th motif, ch2, sl st in next 6ch sp of 1st motif, ch3, skip 3ch sp of 12th motif, sc in 1st dc of 12th motif, ch2, sl st in 1st dc of 1st motif, skip 3dc of 12th motif, 4dc in next 5ch sp, ch2, sc in 5ch sp of 1st motif, ch2, 4dc in the same sp of 12th motif, ch3, skip 3dc, sc in next dc, (ch6, skip 3ch sp, sc in next 6ch sp) twice, ch6, skip 3ch sp, sc in 1st dc, ch3, skip 3dc, 4dc, ch5, 4dc in next 5ch sp, ch3, skip 3dc, sc in next dc, ch6, sc in next 6ch sp, ch6, sl st in 1s sc of 12th motif. 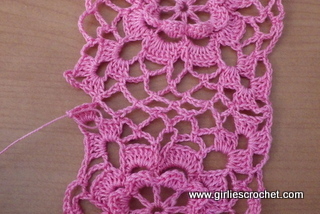 Motif A13: Repeat Round 1-6 of flower square motif. 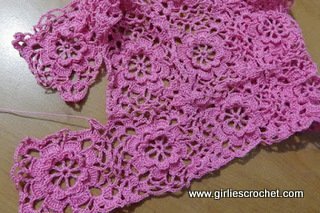 ch2, sl st in next 6ch sp of 10th motif, ch3, sc in next 6ch sp of 13th motif, ch2, sl st in 6ch sp of 10th motif, ch3, sc in next 6ch sp of 13th motif, ch2, sl st in next 6ch sp of 10th motif, ch3, skip 3ch sp of 13th motif, sc in 1st dc of 13th motif, ch2, sl st in 1st dc of 10th motif, skip 3dc of 13th motif, 4dc in next 5ch sp, ch2, sc in 5ch sp of 10th motif, ch2, 4dc in the same sp of 13th motif, ch3, skip 3dc, sc in next dc, (ch6, skip 3ch sp, sc in next 6ch sp) twice, ch6, skip 3ch sp, sc in 1st dc, ch3, skip 3dc, 4dc, ch5, 4dc in next 5ch sp, ch3, skip 3dc, sc in next dc, ch6, sc in next 6ch sp, ch6, sl st in 1s sc of 13th motif. 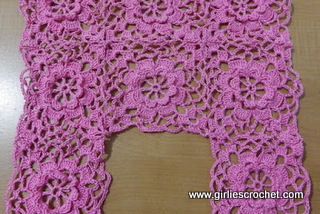 Now, let us proceed on Crochet Kid's Bolero Edging, for instructions please click here.